It was March 27thof 2018, just a regular Tuesday night for most of the baseball players and fans. The Blue Jays were playing a meaningless preseason game against the Cardinals in Montreal. For a certain player on that field, it wasn’t just another regular preseason game, it would be a night he always remembered. That player was 19-year old, Vladimir Guerrero Jr. It had just been announced that his father was becoming a Hall of Famer a couple of months before. His dad who started his legendary career on the same stadium the Blue Jays were playing that night, the Olympic Stadium, as a member of the Montreal Expos. His dad who brought him onto the field on his last game as an Expos player, when he was just 3 years old. 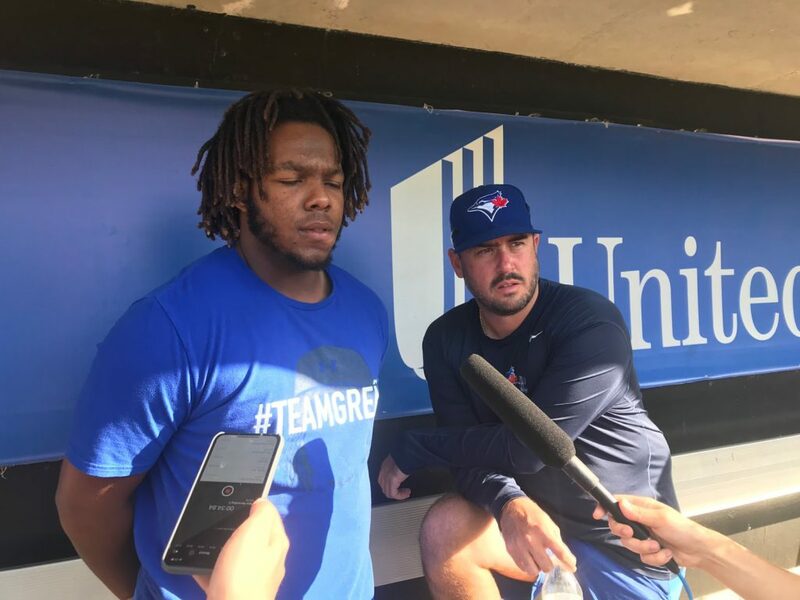 “It was really weird, I didn’t know what was going on, all I remember is that it was his last game in Montreal and he told to go with him and lift my helmet, and that is what I did” Vladimir Guerrero Jr said. That night in March of 2018, was the bottom of the 9th, two outs, nobody on, the score was 0-0. Vlad Jr had entered the game in the top of the 6th and had grounded out in his first at bat. He was wearing the number 27, his father’s number. The jersey number was just one of the many things he inherited from his father. The pitcher was Jack Flaherty, and on a 1 and 0 count he threw the pitch and Guerrero hit the ball out of the park for the walk-off win. Five months later, Guerrero is now the number one prospect according to the MLB.com. But Guerrero is still the same he was before that day in March when he became an Superstar. He still says his favorite music is reggaetón, he still listens to Caribbean singers like Bad Bunny and Alfa. His 2nd favorite sport continues to be basketball. He even still has his same pre-game routine, and still gets exited talking about his similar style to other MLB players. For Guerrero, his Dominican roots are very important, that’s why he says when he gets to the major leagues, he wants his at bat song to be “Traigo Fuego” from fellow Dominican Jose Peña Suazo. When not on the field he loves to spends time with compatriot Syracuse Chiefs prospect Victor Robles and gets exited when they talk about what his father did to help people from his country get a shot into the big leagues. Even though he has had lots of success, he is considered a superstar, and even some think that he can be a future MVP and Hall of Famer. Guerrero is still that little boy, walking to the field in his dad’s final game with the Expos, only now instead of just taking his helmet off, he gets to do what he loves, PLAYBALL.